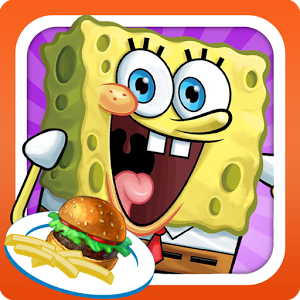 PlayFirst and Nickelodeon team up to bring you the dish-flipping fun of Diner Dash in the hilariously wacky world of SpongeBob SquarePants for both Android Phones and Tablets. Mr. Krabs is expanding his Krabby Patty empire, one restaurant at a time. Help SpongeBob seat, serve and satisfy all kinds of fishy customers in wide array of colorful Bikini Bottom restaurants. Slide and tap to send SpongeBob to customers’ tables. Take orders, seat customers, and collect big tips to upgrade your restaurants! Get 7 free levels of free, fast-paced and hilarious fun! Love SpongeBob Diner Dash? Upgrade the game for even more fun-filled levels and quirky restaurants! Look for special guest appearances from Patrick Star and other characters from the show!